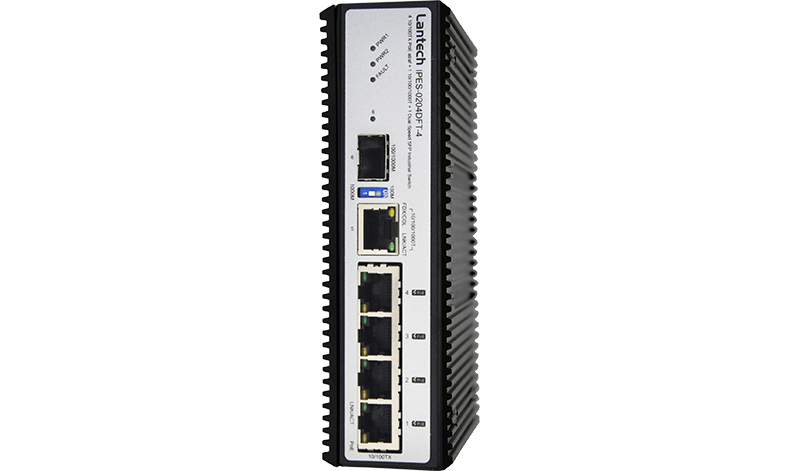 The Lantech IPES-0204DFT-4 is a 4 x 10/100TX + 1 GigaT + 1Dual speed SFP with 4-PoE-injector Industrial PoE+ Switch feeding up to 30W/port for plug-and-play installation. This slim switch is wall-mountable** or DIN rail mountable, making installation easier and flexible. The IPES-0204DFT-4 is designed to meet with critical network environment with IP 30 enclosure and test under extensive Industrial EMI and Safety standards. 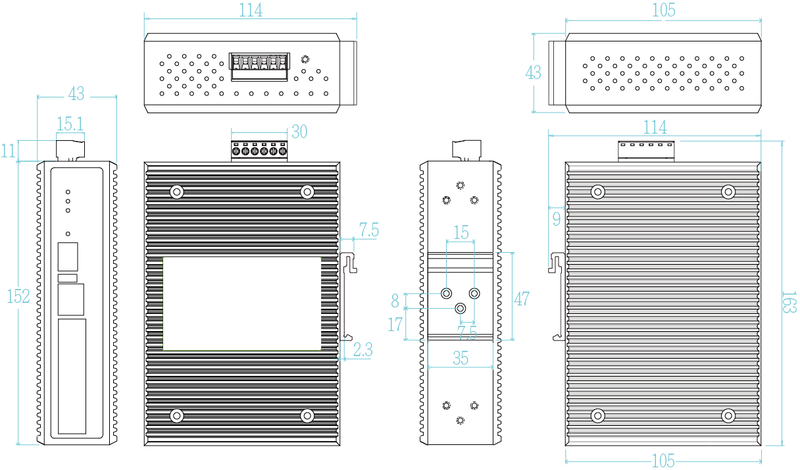 It provides ±2000V EFT/SURGE and ±6000 VDC (Contact) / ±8000 VDC (Air) Ethernet ESD protection, which can reduce unstable environment damage caused by power line and Ethernet. The IPES-0204DFT-4 also supports IEEE 802.3at/af standard for PoE/PoE+ auto-detection and PoE classification resistors for hand-shaking with PD (power device), which can prevent any connected devices from burning down by sending high voltage (48V) out. With voltage boost design, the IPGS-0204DFT-12V can work from 12/24V input power source and boost the voltage to 48VDC to feed the POE power over Ethernet cable for any vehicles that usually has 12/24V power source. The slim compact design is able to fit in variety of cabinets and space. 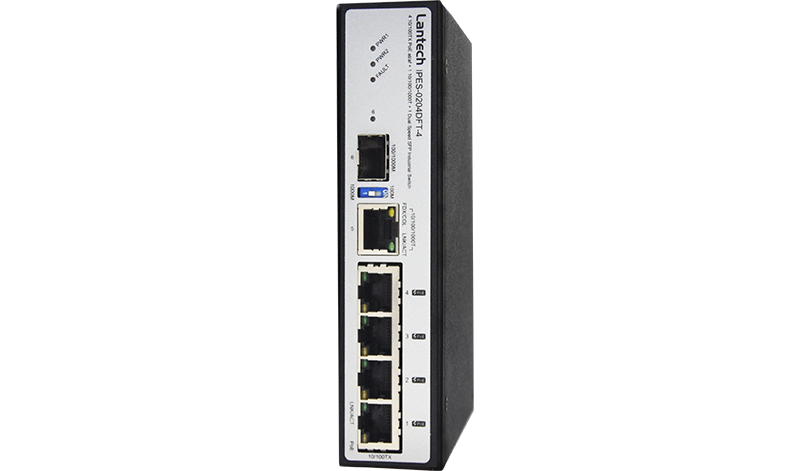 The Lantech IPES-0204DFT-4 is the best Industrial switch to connect with IP Camera, Wireless equipments where are placed outdoor or tight space cabinet such as street cabinet, wireless hotspots etc. 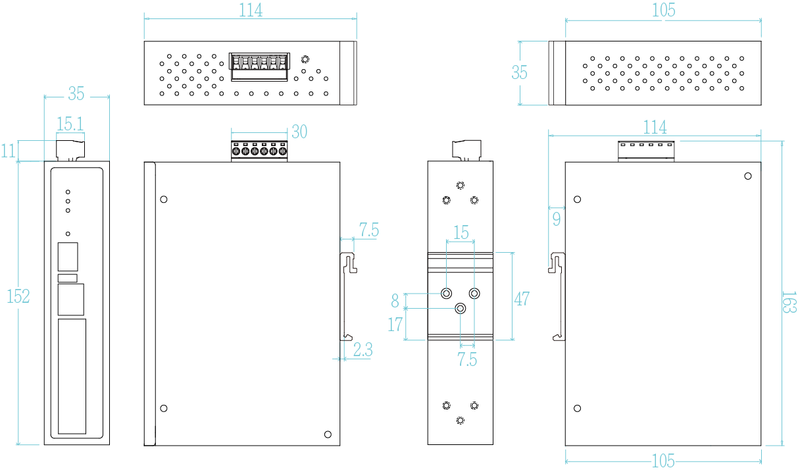 RJ-45 port # 1~# 4 support IEEE 802.3at/af End-point, Alternative A mode. Positive (VCC+): RJ-45 pin 1, 2. Negative (VCC-): RJ-45 pin 3, 6.